Mesa County, Colo. -- Gerald Jordan, Jr., 21 and Justus Ladage, 22, must have thought the side of 29 Road near the I-70 Business Loop overpass was a good place to stop the vehicle Justus was driving, and use suspected methamphetamine. That's where a patrol deputy located them while enroute to the desert via 29 Road, for an unrelated incident. Last night just before midnight, Gerald and Justus, both of Grand Junction, were arrested on charges related to possession of meth and possession of drug paraphernalia. They were both booked into the Mesa County Detention Facility without incident. During the towing process of the vehicle, deputies determined the VIN on the vehicle Justus was driving didn't match the license plate registration. Justus was booked on an additional charge related to the unassigned license plate on the vehicle he had been driving. Since turning 18, Gerald has previously been booked 9 times into the Mesa County Detention Facility, primarily on contempt of court and failure to appear in court warrants. In June 2013, the Grand Junction Police Department arrested him on outstanding warrant(s) and possession of methamphetamine. Deputies arrested him on outstanding warrant(s) and new charges of attempting to influence a public servant and underage consumption of alcohol, in March 2014. Also, in September 2013, he was booked into jail on a bond revocation. Justus, since turning 18, has been booked into the Mesa County Jail on 5 previous times, three of those bookings were for outstanding warrants related to failure to appear in court and/or contempt of court. In October 2014, Justus was booked into the Alternative Sentencing Unit/Work Release program to serve a sentence related to an original charge of driving while ability impaired. And, in October 2011, deputies arrested him on charges related to distribution of ecstasy, marijuana possession and possession of drug paraphernalia. Both defendants are scheduled to appear in court for first arraignment this afternoon. To view updated bond amounts and current charges on any inmate currently in our jail facility, visit our Inmate Inquiry System webpage. Mesa County, Colo. -- Drunk and drugged driving are suspected in two recent arrests where the driver in each scenario initially refused to stop when deputies turned on their vehicle overhead lights in the universal gesture of red and blue flashing lights in the driver's rearview mirror. Add the siren, and it's obvious to everyone in earshot that a traffic stop is being conducted or an emergency is up ahead, either way the driver is to pull their car to the shoulder of the road and stop. Just before 7 p.m., yesterday, deputies arrested Carlos Quintana, 37, of Fruita, after a citizen report came into dispatch of an erratic driver in the area of 30 Road and I-70 Business Loop, Grand Junction. Deputies located the driver in the area of 32 and E Roads, Clifton, where initially the driver refused to stop the vehicle for the deputy displaying his emergency lights and siren. When the deputy did contact the driver of the vehicle he recognized him from a previous DUI arrest he had with the suspect, stemming from August 2015. Deputies arrested and booked Carlos into the Mesa County Detention Facility on one count each of driving under the influence (alcohol and/or drugs), drove vehicle with restrained license for alcohol or drug offense, speeding and weaving--failure to drive in a single lane. During the booking process, an officer with Fruita Police Department, charged Carlos with DUI, careless driving, leaving the scene of a crash after striking an unattended vehicle/property, driving under revocation and no insurance in possession. These additional charges from Fruita Police Department stem from an incident and investigation in the City of Fruita, from December 27, 2015. Later in the night, deputies witnessed a female driver going about 5 miles per hour in the area of D and 29 Roads, Grand Junction. Multiple attempted to get the driver to stop were unsuccessful, until a deputy was able to get her driver's side door open and assist her out of the vehicle, but not before she had stopped driving at one point and then reversed into a patrol car denting her rear bumper, and then driving forward again. Heather Laimo, 34, of Grand Junction, was arrested and charged with one count each of DUI, vehicular eluding, reckless endangerment, weaving--failure to drive in a single lane and reckless driving. Bond amounts have not yet been set for either suspect, but are expected this afternoon. Charges and bond amount updates can be viewed 24 hours a day on our Inmate Inquiry System webpage, for any inmate currently in our facility. STATEWIDE — Whether your New Year’s resolution is to be less stressed, save money or spend more time with family, a New Year’s DUI could ruin your plans. Aiming to keep Coloradans safe as they celebrate the new year, the Colorado Department of Transportation (CDOT) is teaming up with 74 Colorado State Patrol (CSP) troops and local law enforcement agencies for 2015’s final The Heat Is On DUI enforcement period, running from Wednesday, Dec. 30, 2015 until Monday, Jan. 4, 2016. CDOT is partnering with the Regional Transportation District (RTD) and MillerCoors to offer free rides on all RTD bus, mall and rail routes starting 7 p.m. Thursday, Dec. 31 through 11:59 p.m., Jan. 1, 2016. For detailed route and schedule information, call 1-800-FREE-RIDES (1-800-373-3743), text "RIDE" to 90464 or visit CoorsLightFreeRides.com. At least two Colorado law firms are offering taxi fare reimbursement for New Year’s Eve. More information is available at http://www.sawayalaw.com/Free-Holiday-Cab-Rides.shtml (for Denver metro area cab rides) or http://mcdivittlaw.com/mmad/free-rides-home/ (for Colorado Springs and Pueblo cab rides). During last year’s New Year’s DUI enforcement, 329 drivers were arrested for DUI, with Colorado State Patrol (50), Aurora Police Department (49), Denver Police (47) and Colorado Springs Police Department (32) tallying the most arrests. The CDOT Highway Safety Office provides funding to Colorado law enforcement for impaired driving enforcement, education and awareness campaigns. The Heat Is On campaign runs throughout the year with 12 specific high visibility impaired driving enforcement periods centered on national holidays and large public events. Enforcement periods can include sobriety checkpoints, saturation patrols and additional law enforcement on duty dedicated to impaired driving enforcement. More details about the campaign, including impaired driving enforcement plans, arrest totals and safety tips can be found at HeatIsOnColorado.com. Mesa County, Colo. -- Today, investigators release this composite sketch of the suspect as described by the victim in a burglary that was reported in the 2200 block of H Road, in Grand Junction. Further details of the reported incident from December 28, 2015, are listed below. The homeowner from the incident has since been able to meet with investigators and this composite sketch was formed. Anyone who may recognize this person or who may have information about the burglary reported on December 28, 2015, should call Inv. Scott Ehlers at (970) 244-3262. This case remains active and on-going with updates provided as they become available. Mesa County, Colo. -- At 1:50 p.m. today, an adult female reported to 911 that a younger male, possibly early 20's age range, entered her home in the 2200 block of H Road, Grand Junction. The suspect attempted to take video game equipment from the living room area when the homeowner confronted the suspect. The male suspect left the home on foot without the gaming equipment. Deputies, officers from the Grand Junction Police Department, officers with Fruita Police Department--to include a tracking K-9, and Colorado State Patrol troopers saturated the area around 22.5 and H Roads, immediately following the call into dispatch. Law enforcement remained in the area for about an hour and a half trying to locate the suspect. A message was sent to just over 1,000 landlines within one mile of the victim's home asking residents to be watchful of the suspect. The suspect was last seen wearing a camouflage beanie, jeans and a black hoodie. He is a white male with a medium build. Anyone with information about this burglary or suspect should call 911 or Crimestopper of Mesa County, to remain anonymous. Updates on this case will be provided as they become available. Mesa County, Colo. -- Five grams of meth was recovered in the 2900 block of Globe Willow Road, Grand Junction, on December 23, by deputies. Two adults were arrested in connection with the meth and drug paraphernalia, around 5:15 p.m.
Jerome Eickstadt, 38, of Grand Junction, was charged and booked into the Mesa County Detention Facility on charges related to displaying fictitious license plate sticker, possession of drug paraphernalia, possession of methamphetamine and possession of meth with intent to distribute. Amanda Rundle, 37, of Grand Junction, was charges and booked into the Mesa County Detention Facility on charges related to possession of drug paraphernalia, possession of methamphetamine and possession of meth with intent to distribute. Jerome and Amanda each received a $5,000 PR bond and have since been released from jail. They are both scheduled to appear next in court, on December 31 at 8 a.m.
Just before 5 a.m., on Christmas Day, deputies driving past a gas station in the 2900 block of Patterson Road, Grand Junction, spotted a female patron known to them to have outstanding warrants. Deputies contacted the female inside the store, Ashleigh Chaney, 22, of Grand Junction, who was arrested and booked into the Mesa County Detention Facility on multiple outstanding warrants. Along with Ashleigh, in the store, was Jarred Trinkle, 26, of Grand Junction, who was arrested on one count each of possession of a schedule I/II drug (Fentanyl patch) and possession of drug paraphernalia for a syringe. Ashleigh remains in jail on a $250.00 cash only bond and a $1,500.00 cash or surety bond. Jarred remains in jail on a $1,000.00 cash only bond and $5,000.00 cash or surety bond. For updated bond information on any inmate currently in our jail, visit our Inmate Inquiry System webpage. Mesa County, Colo. -- A keen eye by a patrol deputy landed Tyrell Cross, 32, of Montrose in jail yesterday morning. The deputy was responding to a residence in the Fruitvale area for a stolen vehicle when he passed the stolen car going the opposite direction. The driver of the stolen vehicle was ordered out of it and taken into custody in the 400 block of 32 Road, Clifton, just after 8 a.m. Inside Tyrell's sock, deputies located a glass pipe commonly used to smoke methamphetamine. In addition, deputies located tools commonly used to break into vehicles and personal checks belonging to the owner of the stolen vehicle. Tyrell was booked into the Mesa County Detention Facility on one count each of, criminal possession of a bank device, possession of meth, possession of drug paraphernalia, criminal mischief, possession of burglary tools and second degree aggravated motor vehicle theft. While Tyrell was going through the jail booking process, deputies received another call of stolen personal items from a vehicle that occurred overnight. Through the investigation of a second vehicle being broken into and items stolen, deputies were able to connect those stolen items to Tyrell. He was charged additionally with one count of first degree criminal trespass of a vehicle, theft from a motor vehicle, criminal mischief and possession of burglary tools. Tyrell received two $5,000 PR bonds, and was released from jail today. He is scheduled to appear in court next on December 31, 2015, at 8:30 a.m. Yesterday night, deputies conducted a traffic stop on a vehicle in the area of Lois Street and F Road, Clifton. The sole occupant and driver of the vehicle was identified as Shawn Burket, 35, of Grand Junction. Shawn was driving without a valid driver's license and was arrested. Deputies located a digital scale and total package weight of meth more than 25 grams, under the passenger seat of the vehicle Shawn was driving. He was booked into the Mesa County Detention Facility on one count each of possession of methamphetamine, possession of drug paraphernalia, failure to drive in a single lane and drove vehicle when license was revoked. Shawn received a $10,000 PR bond and was released from jail today. He is scheduled to appear in court next on December 31, 2015, at 8 a.m.
For bond information and charges on any inmate currently in our detention facility, visit our Inmate Inquiry System webpage. Mesa County, Colo. -- A local resident sent the Sheriff's Office the following images related to a mailer they recently received advising they had won a multi-state lottery. The hook to this scam is having the victim call and provide personal information that then is used to defraud the victim of their identity, their credit score, drain their bank account or a variety of other negative impacts to a person. Winning a prize or lottery that a person hasn't played, is an immediate red flag that the event is a scam. Also, if the situation or prize seems to good to be true, if you need to provide a payment for taxes or fees before receiving the "free" gift, and/or if you are requested to cash a large check in advance of receiving the prize and forwarding on a portion of that check to another location, those are all classic clues the event is a scam. If you have been a victim of a fraud or scam, you should call non-emergency dispatch at (970) 242-6707, to report it. If you are cold contacted for a potential scam, we recommend you ignore it, delete it or throw it away. Updated Release on December 17, 2015 -- The affidavit for Shauntelle Willson, 13, of Palisade, is linked here. She was formally arraigned on the charges she was arrested on, yesterday afternoon. In compliance with 19-1-304(b.5)(A) her name is being released at this time. In addition, school resource deputies are asking anyone who viewed her Facebook post(s) regarding the gun and who has not already spoken to deputies, is asked to call Sgt. Wayne Weyler, at (970) 244-3356. Shauntelle remains in the Grand Mesa Youth Detention Facility with no bond, at this time. The case remains active and on-going with updates provided as they become available. Mesa County, Colo. -- School resource deputies arrested a 13-year-old female, of Palisade, this morning on charges related to felony menacing, unlawful possession of a firearm by a juvenile, interference with students at a school and harassment. She is currently being held for processing by deputies and is expected to be booked into the local youth detention facility later today. Students initially advised school administrators at Mount Garfield Middle School yesterday about posts on Facebook related to this female student having a handgun and threatening to use it on school grounds. Consent searches and interviews were conducted yesterday evening and this morning, leading to the arrest. The images of the handgun have been removed from Facebook and the weapon has not been recovered by deputies, at this time but it remains a primary focus of the investigation. The student's identity is not being released at this time in compliance with Colorado Open Records Act. This case remains active and in the early investigative stages with updates provided as they become available. The students who reported this dangerous behavior should be commended for coming forward about the social media posts related to their school. Law enforcement, working in tangent with School District 51 officials were able to investigate swiftly and deter the threatening incident. Mesa County, Colo. -- Emergency service public information officers from across Colorado gathered in Denver yesterday for their annual award ceremony, with recognition going to both professional spokespeople and media. Heather Benjamin, our agency's public information officer, was named the 2015 PIO of the Year, through the professional organization-- ESPIOC. "This award symbolizes the ongoing commitment and innovation Heather brings to her work," Sheriff Matt Lewis, said. "We have long known she is skilled and deserving of this statewide recognition. We couldn't be more proud of her, and the investment she makes everyday on behalf of our community and agency!" The anonymously submitted nomination for Heather, included, "Heather is always on the driving edge of new and innovative ideas to reach the Mesa County audience. Her social media campaigns reach an enormous demographic that parallels large market agencies. Heather is a great mentor and never turns down the opportunity to lend a helping hand or a piece of advice. Lastly, Heather has a heart of gold and a large amount of passion for her job." Heather was hired as the Mesa County Sheriff's Office spokesperson in June 2007. since then, she has grown the job duties, and expanded the community reach for the agency through multiple outlets and social media platforms. She holds a Bachelor's degree in Journalism from the University of Wyoming. Mesa County, Colo. -- Dealing drugs when a deputy is nearby landed Troy Schneiter, 47, of Idaho, in jail after the deputy heard two adult females ask Troy if he had any drugs "to spare." Then the deputy witnessed Troy hand over a bag of suspected marijuana in exchange for cash. Personal sales of marijuana is prohibited in Colorado. The deputy also located more than 12 grams of packaged methamphetamine in Troy's possessions. He was booked into the Mesa County Detention Facility on one count each of possession of meth and distribution of marijuana. Troy received a $5,000 PR bond and is scheduled to appear in court next, on December 10, at 8 a.m.
Saturday night just before midnight, deputies were called to a structure fire in the 2900 block of C 3/4 Road. Witnesses on scene described a woman pouring gasoline on a camper just before it was seen burning. Kimberly Reece, 40, of Grand Junction was arrested and charged with first degree arson, possession of methamphetamine, criminal possession of identification documents and possession of drug paraphernalia. Kimberly was released from jail on a $5,000 PR bond and is scheduled to appear in court next, on December 14, at 8 a.m.
A driver weaving, Friday night, was stopped in the 2800 block of North Avenue, Grand Junction. The driver, Nancy Wilhelm, 51, of Palisade, was ultimately arrested on charges associated with meth possession, possession of drug paraphernalia, displaying expired license plates and failure to drive in a single lane. Nancy received a $5,000 PR bond and is scheduled back in court on December 14, at 8 a.m. Also in the vehicle with Nancy was Cristina Lopez, 36, who was booked into jail on an outstanding warrant associated with drugs. Driving drunk and providing a false name to a deputy upon a traffic stop, landed Patrick Salas, 33, of Grand Junction, with a round of new charges--two of which, are felonies. Patrick previously had his driver's license revoked for habitual traffic offenses. He was booked into the jail on multiple traffic violations, DUI, criminal impersonation and aggravated driving while being a revoked driver. Patrick posted a $1,000 cash only bond. Mesa County, Colo. -- This afternoon, Sheriff Matt Lewis and his command staff present a variety of awards during the agency's annual award ceremony event. The following is a summary of the awards presented and the very deserving recipients. Citizen Citation of Merit: Awarded to a citizen for assistance rendered to the agency, which resulted in the saving of a life or the advancement of justice in any significant way, which put the citizen in possible danger or risk to their lives or property. Kimberly Smith was presented the Citizen Award by Sheriff Matt Lewis after a few words from Sgt. Matt King. Kimberly fought of a carjacking and violent suspect leading to his apprehension and limited further crime spree. Cathy Kast and her daughter Alexis Kast are being presented the Citizen Award by Sheriff Matt Lewis. The mother and daughter actively fought off a home intruder and later spotted him, calling in his movements to law enforcement allowing him to be arrested for the burglary incident. Volunteer Recognition went to Tom Freeman who volunteers with the Sheriff's Office for 18 years. 25 Years of Service with Mesa County Sheriff's Office. Commendation Awards for employees who embodied Outstanding Service. Excellence Award: Awarded to employees who, through their own efforts, have developed and initiated a means of significant increasing the agency's administrative or operational efficiency or effectiveness. Life Saving Award: Awarded to members of the agency who, while employed, perform significant life saving measures on an individual; and that these actions led to the prolonging of life to the extent that the victim was released to the care of medical authorities. Medal of Merit: Awarded to an employee who voluntarily places himself at significant risk to apprehend a violent criminal suspect in the commission of a crime. Medal of Valor: Awarded to an employee who has performed an act of valor beyond the call of duty in a situation presenting a significant danger to the employee, and during which the employee preserves and carries out whatever must be done with demonstrated courage and professionalism to save a life or perform a duty. The employee in so doing severely jeopardizes his own life. 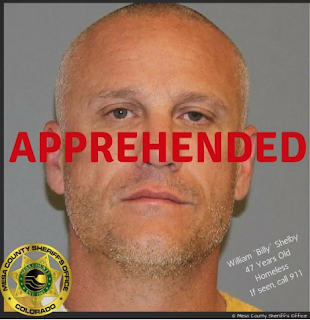 Mesa County, Colo. -- Deputies looking for a man with two active probation violation warrants yesterday evening, found a little more at a house in the 500 block of Placer Drive, Grand Junction. Curtis Haining, 36, of Grand Junction was contacted by deputies just after 8 p.m. at the address on Placer Driver. He was arrested without incident and booked into the Mesa County Detention Facility on two warrants for probation violations. Eric was booked into the Mesa County Detention Facility on charges related to possession of meth, criminal impersonation, possession of drug paraphernalia and on a fugitive from another jurisdiction warrant. For updated bond information on anyone currently in our jail facility, visit our Inmate Inquiry System webpage. Mesa County, Colo. — Deputies arrested Shelby in Grand Junction just before midnight on December 2, 2015. He was booked into the Mesa County Jail on outstanding charges along with new charges of criminal impersonation, outstanding warrants, and contempt of court. Bond information on any inmate currently in our jail can be found on the inmate inquiry webpage. Mesa County, Colo. -- William "Billy" Shelby, 47, is homeless and likely in the Grand Junction area and he has a $250,000 warrant out for his arrest. Billy is wanted on felony crimes associated with burglary and a violent assault. He is described as a white male, 5 feet 10 inches tall, with brown hair and hazel eyes, weighing in about 180 pounds. It's likely he is riding a bike and may frequent the area of D and 29 Roads, Grand Junction. If you know his whereabouts or see him, please call 911 and report it to law enforcement.